Once in a while when I eat out at “mixed-rice” stalls (stalls which sell white rice with a mind-boggling choice of side dishes which you can choose and be priced accordingly), I will eat this dish – Ginger Sauced Chicken. Well, I confess that I don’t actually know the real name of this dish but since it is a ginger sauce based dish with chicken, I reckoned it should be called Ginger Sauced Chicken. After a few tries outside, I attempted this dish and it turned out quite okay. Only thing is I haven’t actually perfected the art of having the chicken nicely fried without having too thick a batter. Whilst the picture above was as a result of what I cooked, I am modifying the recipe a bit into what I think would be better. You can actually fry the chicken pieces beforehand or don’t. It is up to you really. But the highlight is the ginger sauce. Give it a try. Marinade chicken pieces with 2 – 4 teaspoons of ginger juice for 3 hours. Heat oil in wok. Dust chicken pieces with some corn flour and deep fry the chicken pieces till golden brown. Remove fried chicken and set aside. Remove excess oil from wok leaving about 2 teaspoons of oil behind. Add ginger slices and saute till aromatic. Add garlic and continue to saute till garlic starts to brown. Add about 3 tablespoons of ginger juice and seasoning. Bring sauce to boil. Add a little bit of corn starch or potato starch to thicken the sauce (if it is runny), return the fried chicken pieces and add spring onions to coat them all. Dish up and serve hot with white rice. hmm … I love this dish. Have you tried coating the chicken pieces with egg and then just dust them with plain flour? I do not know if it will give the same result as you wanted it. I do this with my sweet and sour pork. That looks delicious and easy to make as well. I may as well try to make it this weekend since I have been on a hiatus from the kitchen. Will keep you posted on my take of the yummy looking chicken. Cooking Ninja : I’ve thought of coating it as suggested but it is usually not crispy. But then again, I don’t think it is meant to be crispy anyway. LOL! reeseboston : Let me know, ya? Hope you’ll like it. Pablo, I made the ginger chicken for dinner earlier and it was gone in minutes. Bf said it tasted like general gau’s chicken sans the thick dark sauce and sugar. It is difficult to explain the variants of chinese food to ang moh as they can barely distinct one from the other. A point to note, I love this dish a lot and it will definitely be one of the staple in our family. Thank you for sharing the recipe. reeseboston : Thanks for letting me know! I’m glad this recipe is spreading over to that part of the world now 😉 BTW, I’ve absolutely no idea who’s general gau. LOL! hahahaha! 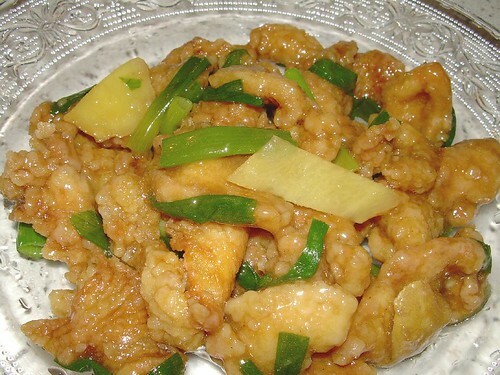 General Gau’s chicken is one of the most famous polynesian (pseudo-American Chinese food)entree in the US. It taste good. Tell you what. As and when I get to come home to KL for holidays, I will remember to bring a bottle of the sauce and pass it to you. Hi, read today’s Star newspaper n found your blogsite. I am going to be full time homemaker soon n yr site w easy to follow recipes will help a lot. I am like walking down the memory lane of the dishes my late mom used to cook when i was young. Just want to say I enjoy going thru the site n Thanks! Hey, pablopabla! one tip, try using Potato Starch + rice flour instead of Cornstarch for the frying. Alternatively, try a plain flour and potato starch ratio 5:1 and the add is water and an egg. If you’d like the batter to separate from the chicken after frying, coat the chicken lightly with oil.